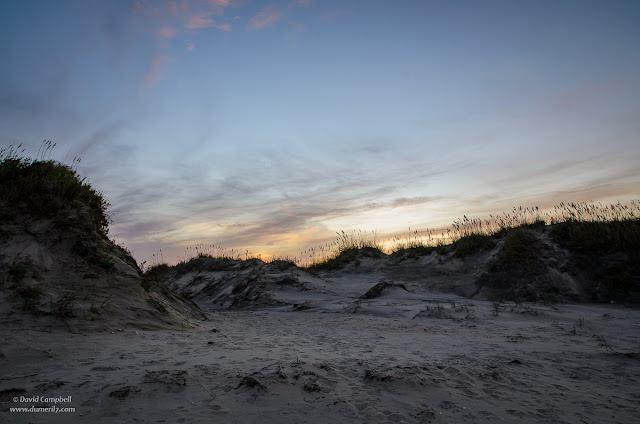 We just returned from a camping trip on the Outer Banks. Had a great time. As a rule, I prefer camping in the mountains. It's usually cooler, you don't track sand into all your belongings. I also just like the the forest more than the ocean. But mountains are tough for sunsets and sunrises. The sun is usually obscured long before it gets very low in the horizon, so the colors are often not very good if you get them at all. The beach on the other hand, you get crazy-long sunsets and sunrises. This photo was from early in the cycle when the colors were still soft and pastel. But this sunrise just kept giving up more and more color for a good 30 to 45 minutes. I'm sure I'll post other photos from this same sunset which are more vivid, although I like the muted colors too. By the way, for this trip I packed two cameras: The waterproof Fujifilm XP120 point-and-shoot that I normally take kayak fishing, and my trusty old D7000 which has been sitting on the bench waiting to go into the game while I shot with the D7500 that I got back in spring. Camping on the beach, I knew sand could be a problem and I didn't want to subject my new camera to it, so I brought my back-up. The XP120 I brought to take photos in the ocean.